Looking like a cross between Star Wars, Buffy the Vampire Slayer, and the symbols that weird kid used to draw on his exercise books at school, Karf Oohlu‘s starfighter certainly seems to have something of the occult about it. Head over to Karf’s photostream to chant some spacey incantations and sacrifice a chicken. This is, apparently, a Molniya – I, an EMP Starfighter used by the Russian Space Corps, capable of… er, frankly, we have no idea. But what we do know is that the building techniques used to create it are absolutely terrific. The unique design comes from the mind of Flickr’s Legohaulic and you can see more, as well as read details of what this ship is actually for, at his photostream. 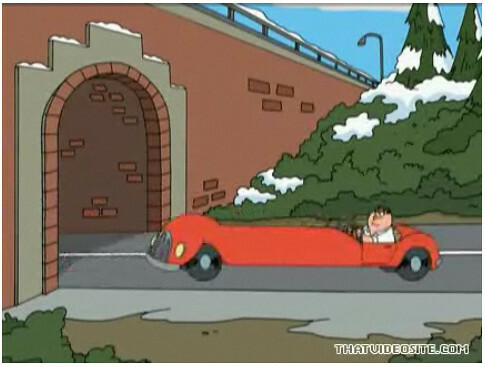 Click the link above to jump to hyperspace (or something), and we’ll return with a shedload of actual proper cars shortly. We promise. Previous bloggee Crimso Giger has started something rather cool on Flickr, by challenging several of his sci-fi building compatriots to construct their own versions of his ‘RMX Starfigher’, each using their own style and to fulfil their own chosen purpose. The resultant spacecraft all share Crimso’s primary-colour paint scheme and primary-school shape designation, but vary beautifully with the each builders’ own construction style. The version pictured above comes from TLCB regular F@bz, who has chosen to build a sleek and smooth interpretation of Crimso’s original, whilst fellow challenger and TLCB debutant lokiloki29 has taken a compact and upright route with his RMX variant below. You can see more of the two entries so far by clicking on the links in the text above, where you can also see Crimso Giger’s original spacecraft (pictured below) and find links to further interpretations of his design from some of Flickr’s other sci-fi builders. 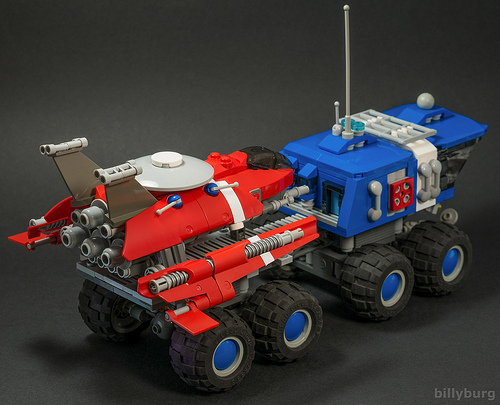 “Variety is spice of life“, and here at The Lego Car Blog we like to add flavour to our diet of automotive builds with the occasional aeroplane, train, ship or spacecraft. Our Elvish workers hate variety. They much prefer a predictable diet of Lego, Smarties and violence: sometimes varying it in the form of violence, Smarties and Lego; or just violence served on its own. First on today’s menu is Damien Labrousse’s “Space Wulf 190”. This sleek machine features a ventral fin almost as large as the one on top. Fortunately it folds neatly out of the way when the undercarriage deploys, allowing the ship to land safely. 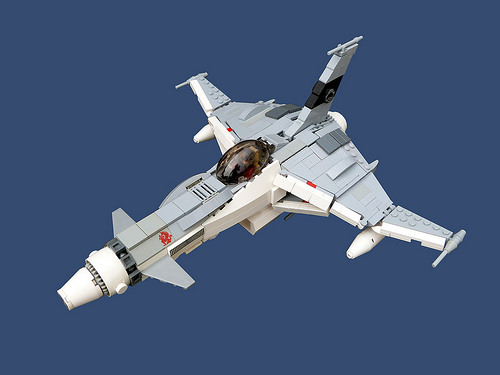 Featured below is Chris Perron’s aggressively agile “Kronos” fighter. 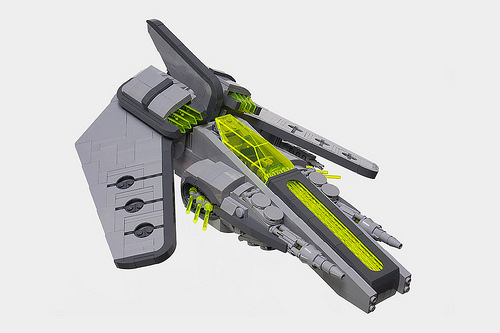 This features smoothly brick-built wings and some great trans-fluorescent details, which add some zing to the subtle, grey colours. You can see more of each ship by clicking the links in the text. 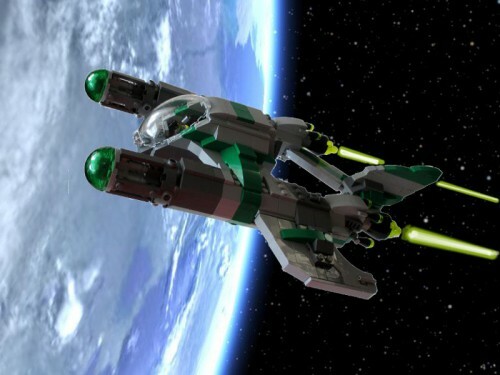 The Elves were incredibly excited when they found this super Starfighter Transporter by billyburg. They thought that each of hub caps on its 8 wheels was a blue Smartie. Alas not but we have rewarded them with a handful of meal tokens. We’ve previously blogged the chassis of this machine but now it’s been topped off with a colourful, red starfighter which uses a nice mix of Technic panels and System bricks, plus a bit of white sticker. 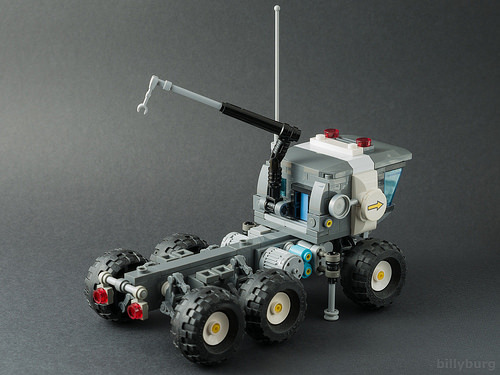 Billyburg has also posted a rather nice space-crane, in the same micro-scale, as you can see below. Click this link to billyburg’s Flickr Photostream to see more of both creations. 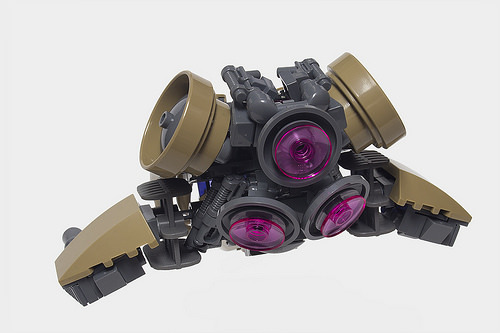 The Small Starfighter Building Contest on Flickr has generated some novel and creative solutions to fitting a minifig scale spaceship into 14x14x6 studs. We’ve already covered some of the builds but the contest has now closed* with the onset of SHIPtember. One of the latest postings is Chris Perron’s “TYLYK“, an alien looking ship in the unusual colour of dark tan. 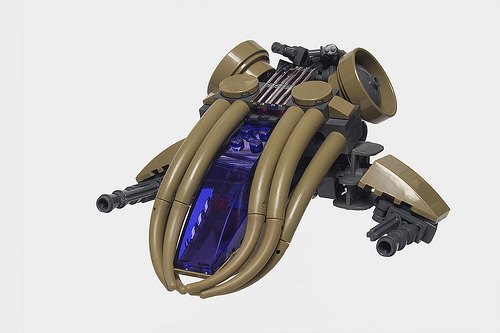 “NPU” is an often overused phrase in the world of sci-fi Lego but the tentacles which wrap around the cockpit are certainly different. 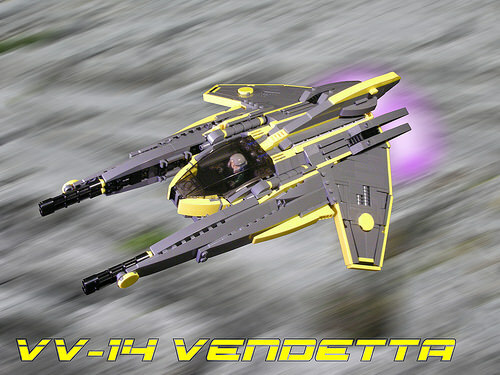 The ship also includes two useless Lego pieces and some nice greebling for good measure. Click this link to Chris Perron’s Photostream to see more. *Happily resulting in a downturn in the number of Elves running around the office shouting “Pew! Pew! Pew!”.